Your list of things to see and do now includes Stadin Panimo, Linnanmaki Amusement Park, Korkeasaari Zoo, and other attractions. 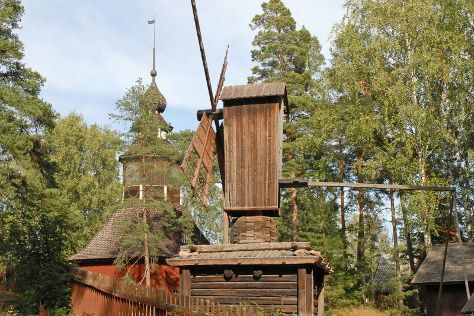 Get some cultural insight at Seurasaari Island and Open-Air Museum and Ullanlinna. Visiting Bellevue Beach and Hiidenvuori will get you outdoors. Venture out of the city with trips to Arboretum Mustila (in Elimaki), Fagervik Museum (in Inkoo) and Kotka (Riverside Park & Linden Esplanade). Spend the 23rd (Sun) exploring nature at Ekenas Archipelago National Park. Next up on the itinerary: hunt for treasures at Hakaniemi Market, admire the masterpieces at Kansallisgalleria, wander the streets of Katajanokka, and look for all kinds of wild species at Laajalahti Nature Reserve. For photos, ratings, and tourist information, go to the Helsinki day trip planner. If you are flying in from United States, the closest major airport is Helsinki Vantaa Airport. In June, plan for daily highs up to 65°F, and evening lows to 50°F. Finish up your sightseeing early on the 23rd (Sun) so you can travel back home.